Alcoa hopes to cash in on the boom in commercial aircraft orders by building a new plant that will make engine parts for big jets. Company officials announced Thursday that they will build a $100 million plant in La Porte, Indiana, to make nickel-based engine parts for commercial airliners. Alcoa already makes the same components - in smaller sizes - for engines that go on business jets and planes flown by regional airlines. Boeing and Airbus are stepping up production as airlines order new, more fuel-efficient planes. Asian airlines in particular are expected to grow rapidly as a booming middle class yearns to travel. "This is a massive growth market, more than 8 years of backlog," CEO Klaus Kleinfeld said in an interview. 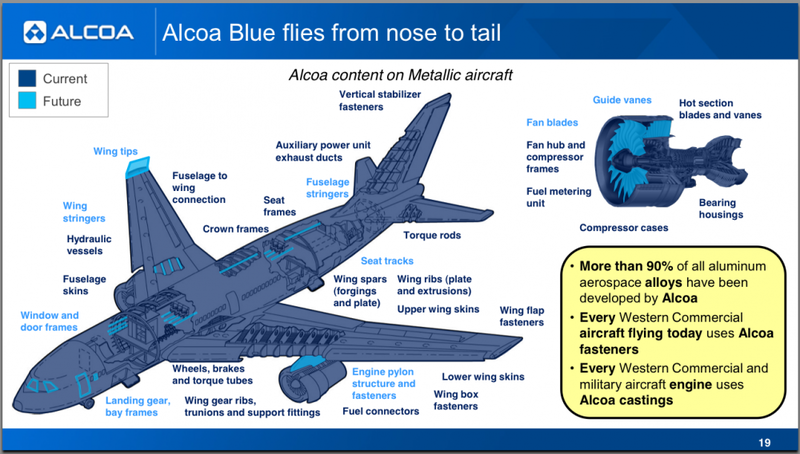 Alcoa expects the aerospace industry to grow by 8 percent to 9 percent this year. Airlines have long gone through a boom-and-bust cycle, but Kleinfeld said he wasn't worried about that. He said smarter management and Asia's changing demographics will help the airlines. The Indiana plant will make parts that form the rib cage around a jet engine's vital parts, so its customers are likely to be the big engine manufacturers such as GE and Rolls Royce. Alcoa wouldn't disclose customers, but said it has enough long-term contracts to support the facility, which is due to be completed late next year and eventually employ 329 workers. Alcoa said it could get up to $4 million in state tax credits for job creation and another $7.1 million in city tax incentives over 10 years. The plant is part of Alcoa Inc.'s strategy to downplay its roots as a mining and aluminum-smelting company, which includes a large smelter near Goose Creek. Aluminum prices haven't recovered from the deep recession in 2008, and Alcoa has been idling smelters to reduce capacity and cut costs. The company has been increasing its focus on producing finished aluminum products for aerospace, autos and other industries. Those segments account for more than half of the company's revenue and three-quarters of its after-tax operating income. The Zinc plant at the Nyrstar smelter will shut down which will costs around 124 jobs by the end of 2016. However, there is great hope for future growth. The plant closure is a business decision as the plant has been making a great loss. There will be no forced redundancies, but the 124 employees now at the zinc plant will not be replaced. Two week ago, positive news about Nyrstar reported that the company would invest around $514 million for the plant enhancement with the support of the State Government. Amid this, the news relating the plant closure came. The redevelopment is scheduled to finish by 2016 and it is reported that around 400 jobs would be created in the construction phase, but it is not yet clear about the overall job gains and losses. On Wednesday night, the Chamber of Commerce and Industry networking forum at the golf club discussed about the subject concerning the job loss due to the closure of the zinc plant. Bertus de Villiers, Nyrstar vice-president for metals refining confirmed that the 120 plus workers would affect by the decision of closure and they would be redeployed, but their positions would not be filled. He said that the decision to close the plant is basically a business decision as it had been making loss of around $20 million for the last four years. He added that it was a difficult but necessary decision and they were able to do this without taking the process of forced redundancy and were not affecting the employees by this negative decision. He added that the plant would run for another two months and of if they could make this things work, there would be plenty of opportunity for growth. 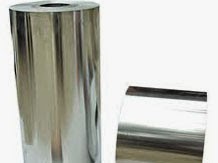 The aluminum oversupply will be offset by strong demand growth outlook, lending support to aluminum prices in 2015, says a recent study report by Capital Economics. The addition of capacities in the Middle East and China has lead to surplus in aluminum market. Aluminum production by China grew 6% in 2013. The production growth is expected to reach 10% in China this year. 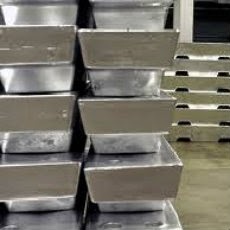 According to Capital Economics, the increased supply of aluminum will be offset by the rising aluminum demand from traditional consuming sectors. The recovering automotive and construction sector in the developed world, especially the US looks positive for aluminum. Also, the rise in production of consumer goods from China will keep the aluminum demand high. Further, the supply surplus will reduce considerably in 2015 as China curtails production at non-performing smelters. Major aluminum producers elsewhere have announced production cuts. 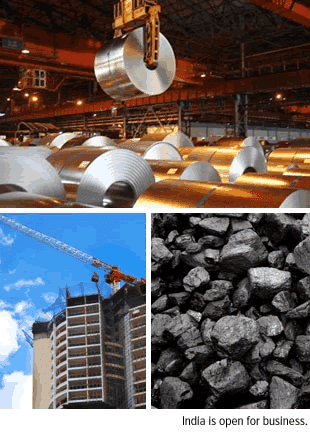 The US –based Alcoa plans to cut one-fifth of its capacity by 2015. The report forecasts that the aluminum price is likely to reach $2,000 per mt by end-2015, which is nearly 12% higher than the current LME price for the metal. Banks are not allowed to participate in the Indian commodity derivatives markets. Such non-participation of the most important financial institution of the country – banks – is an important missing link in the evolution of this market in India. It is a fact that there are regulatory restrictions on part of banks too that restrict their participations in commodity futures markets. But, the fact remains that their participation in commodity exchanges is a win-win situation for all: it helps the banks, it helps commodity markets,and in the process, it helps the economy as a whole. While the above-mentioned report recognises that banks’ participations in the commodity derivatives market will contribute to the depth and width of the market, what this process also contributes to is the availability of an unparalleled risk management platform for the banks themselves, as banks also need to manage risks arising from commodity price volatility. 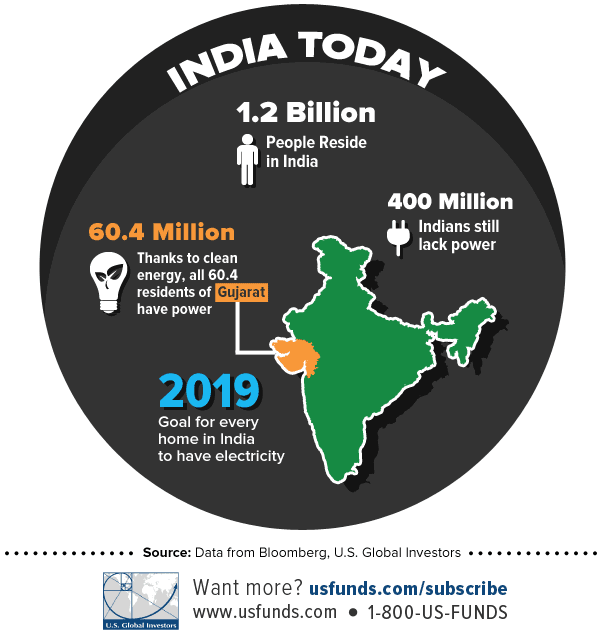 Thanks to globalisation of the Indian economy and business expansion of Indian banks, their exposure to rising commodity price volatility is significantly high – 19 per cent according to some estimates made in 2011-12. Yet, while banks have been allowed to manage other risks in their portfolios, they do not have any mechanism to hedge commodity price risk in an effective and transparent manner, barred as they are from entering the commodity derivatives market. Further, banks can act as intermediaries and aggregators, facilitating the risk management actions of farmers and other small players who on their own may find considerable barriers to enter this market. World-over, there are examples galore on banks’ participation in exchange-traded commodity derivatives market on behalf of farmers, enabling the latter manage risk exposure better and increase their incomes. Mention may be made of Rabobank’s intervention in Tanzania and Nicaragua and Banco do Brasil’s intervention in the Brazilian agricultural market through issue of exchange-traded Cedula Producto Rural contracts. Many of these interventions are made through designing and offering customised hedging solutions fulfilling the requirements of farmers. Besides, by aggregating small participants, banks enable even small farmers to reap the benefits of hedging. On a similar note, the non-farm sector, especially the small and medium enterprises, too can be a significant beneficiary of the commodity futures market, which can be increased manifold by the facilitative role provided by banks. At the micro level, with a comprehensive risk management policy that encompasses commodity price risks, banks’ financial and human resources can be freed to cater to more important strategic functions. Under the evolving international regulatory regime where norms on credit and provisioning are increasingly being linked to risk assessment of banks’ portfolios, hedging against commodity price movement will actually contribute to freeing of financial resources – enabling not just achievement of priority sector targets for Indian banks, but also their overall business expansion. Through focused deployment of appropriate credit products, these developments could, at the macro level, go a long way in smoothening and quickening the credit cycle, thereby enhancing productivity of credit. From the commodity market’s perspective, banks’ participation will help in providing the market with the much-needed long-term traction. This will help the long-term hedgers’ participation on the one hand, by reducing the overall costs of transactions (including the impact costs), and will help enhancing the hedging efficiency. There has often been a complaint from large corporates about lack of long-term traction in the Indian comexes, which inhibit their hedging efficacy. Banks’ participation will help ameliorate that concern. Here lies the “Pareto” improvement through banks’ participation in Indian comexes. On the one hand, it will be in the interest of banks’ own sustainable growth. Barclays calls the Indian rupee one of its favorite high-yielding emerging-market currencies. 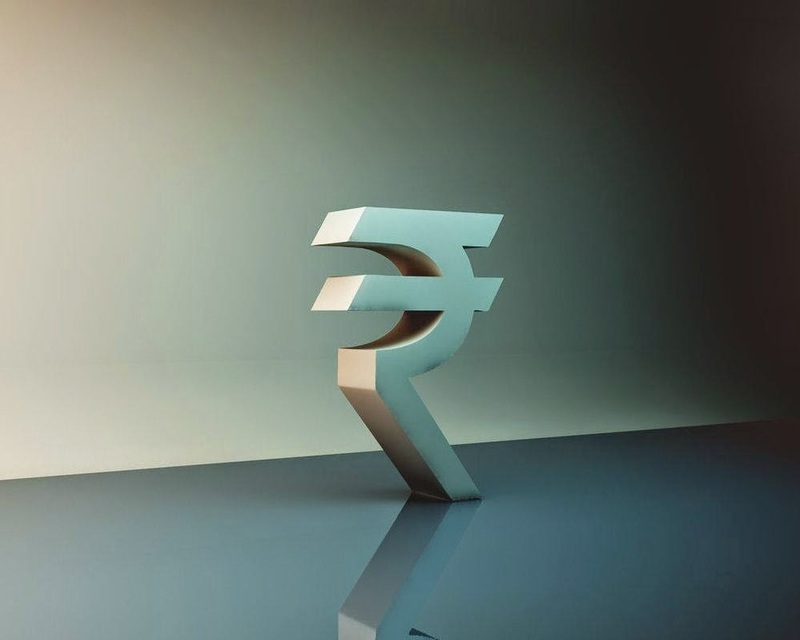 The bank now sees the Indian currency at 58 rupees to the dollar in one and three months, compared to 60 previously. Barclays said that its more constructive rupee view reflects a combination of supportive factors including, an election result has encouraged portfolio inflows, a narrowing current account deficit and a globally supportive environment for carry trades. “Central-bank intervention will likely continue to limit the pace of INR appreciation against the USD, but the large size of portfolio flows implies that modest appreciation is likely to be tolerated by the RBI (Reserve Bank of India), in our view,” said Barclays. Barclays continues to think that a renewed bout of INR depreciation is unlikely, given the much-improved fundamental backdrop, led by a markedly smaller current account deficit, higher FX reserves, largely range-bound inflation and enhanced RBI policy credibility. 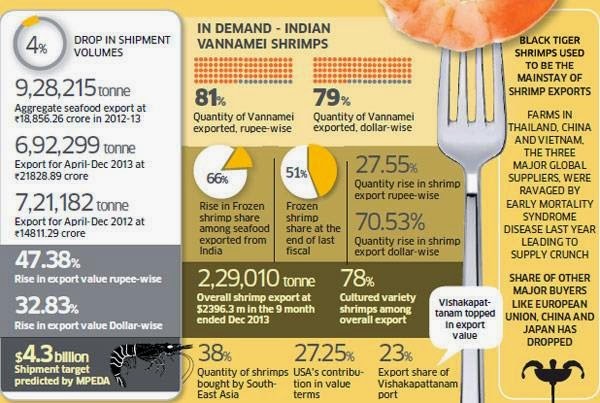 Rupee was as muscular as 69.22 rupees back in August, and the weak Indian currency at the time was one of the factors – along with gold-import restrictions-- blamed for reduced gold buying in the country, since a weak rupee makes gold more expensive for Indians. Many market participants in the base-metals arena looked favorably upon zinc, said Robin Bhar, metals analyst with Societe Generale. “It is anticipated that recent and expected closures of a number of zinc mines over this year and next would lead to a supply crunch underpinning a rally in prices,” said Bhar, outlining factors discussed at a recent zinc conference in Istanbul. Bhar cited closures and expected closures in Canada, Ireland and Australia. However, mine closures are the only known certainty. 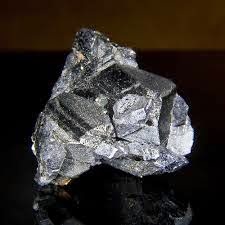 There are many unknowns regarding zinc’s supply/demand fundamentals, such as demand growth, substitution, how much higher prices would incentive new projects and the Chinese mining sector. “A supply crunch does look inevitable but it’s likely magnitude and duration is highly uncertain and subject to a variety of factors,” Bhar added. 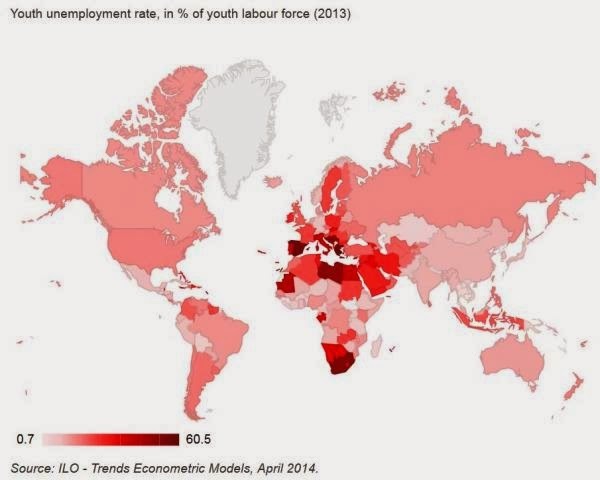 We have some bad news... for Africa: according to the latest data released by the International Labor Organization, your youth unemployment problem is almost as bad as that of Europe. Maybe more to the point, just what is it about those bracing Mediterranean sea breezes (not to mention mandated Eurozone "political capital" and relentlessly liberating - of one's job - globallization) that makes the young people in the adjoining countries choose to do pretty much anything but work? 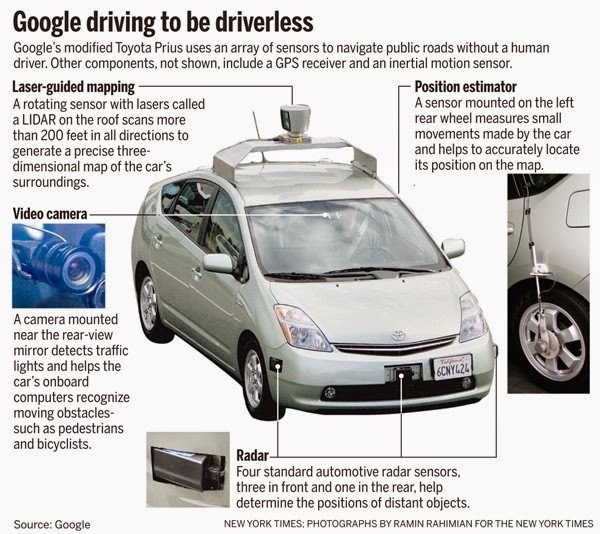 The co-founder of Google Inc. – Mr. Sergey Brin revealed that the company has designed its own self-driving vehicles. The company developed a two-seated prototype that transports passengers at the push of a button. According to the company’s statement, Google has been working on the project for the past four years. The company revealed that the vehicle prototype lacks a steering wheel, accelerator pedal or brake pedal and basically looks like a gondola on wheels. The owners of such a car will be provided with the opportunity to set a destination address and the vehicle basically will do the rest by driving them there. The top speed disclosed by Google for now is limited to 25 miles per hour. The company said that it works in collaboration with several automotive partners. 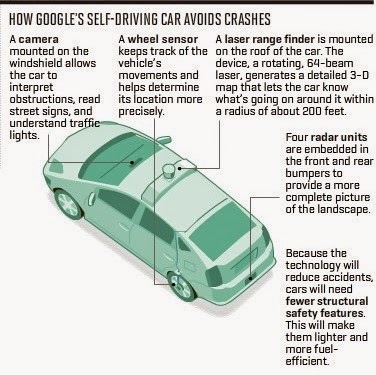 For starters, the co-founder Mr. Brin said that Google Inc. has set a goal of manufacturing 100 to 200 test cars. The news comes at a time when there is a campaign aiming to make driverless vehicles more popular in order to make the roads safer. 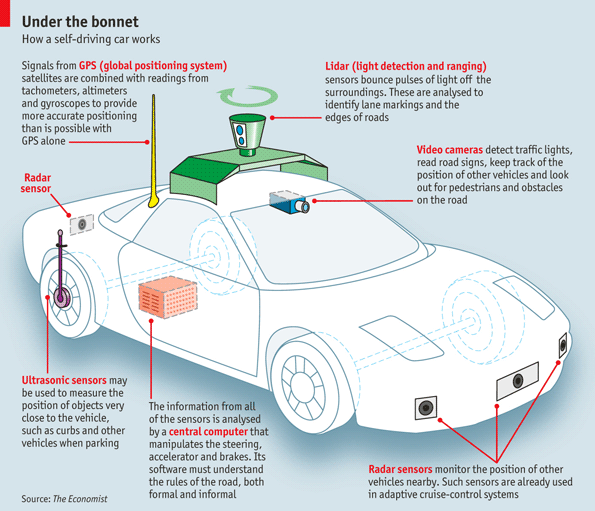 The design of Google’s driverless cars resembles the one of Fiat 500 or the one of Mercedes-Benz Smart, but it won’t be equipped with a gas pedal, brake, steering wheel and gear shift. The only operations controlled by the driver will be pressing a red “e-stop” button that is intended for panic stops, as well as pressing a start button. According to one of the analysts working at IHS Automotive – Egil Juliussen – the self-driving vehicles will gain greater popularity over the next twenty years. Mr. Juliussen said that the number of such cars in 2035 is expected to reach 11.8 million, and also projected that almost all cars are to become self-driving by 2050. Google Inc. was 1.96% up to close at 574.87 dollars per share yesterday, marking a one-year change of +30.34%. According to the information published on CNN Money, the 41 analysts offering 12-month price forecasts for Google Inc. have a median target of 660.00, with a high estimate of 750.00 and a low estimate of 525.00. The median estimate represents a +14.81% increase from the last price of 574.87. Rioters torched vehicles, equipment and buildings at Vale's nickel mine in the French Pacific territory of New Caledonia over the weekend, as anger boiled over about a chemical spill in a local river. The $6 billion Vale plant at Goro in southern New Caledonia was closed earlier this month after some 100,000 liters of acid-tainted effluent leaked, killing about 1,000 fish and sparking renewed protests at the mine site. The Vale plant has a production target of 60,000 tonnes of nickel at full capacity, compared with global supply of around 2 million tonnes. But it has been beset by problems in recent years, including several chemical spills and violent protests. Tensions between the local population and Vale escalated over the weekend with young protesters frustrated at the latest spill by the Brazilian-based giant and a lack of response from indigenous Kanak chiefs, according to local media. Television footage showed images of burnt mining vehicles and equipment. "There was damage at the site, but no damage to the plant. We had burned vehicles, one administration building was damaged, but no damage to the plant itself," Vale spokesman Cory McPhee told Reuters. Peter Poppinga, an executive director at Vale, told Les Nouvelles Caledoniennes newspaper that damage to the mining site was estimated at least $20 million to $30 million, including the destruction of perhaps one third of the truck fleet. "If there is no activity for several months, we will shut the plant, but that's not the case. The closing of the plant is not on the table," Poppinga was quoted as saying. The scale of the damage could not immediately be independently verified. Nickel mining is a key industry in New Caledonia, which holds as much as a quarter of the world's known reserves. Vale's plant is the second-largest employer in the southern province, with some 3,500 employees and contractors, including a large number of Filipino workers. New Caledonia's southern provincial government ordered an immediate halt to operations after the spill earlier this month and started legal proceedings under its environmental code. The local government, which changed leadership last week, said it would not lift the production suspension until safety procedures were revised, an oversight committee was reinstated and an independent expert's report was completed. "We got to this point because, clearly, part of the local youth, particularly from the southern tribes, reject the perspective of maintaining the plant in activity, even with the reinforcement of safety procedures," Philippe Michel, the newly elected president of New Caledonia's Southern Province, told local television on Monday. Global nickel prices hit a 27-month high earlier this month and are up by about 40 percent this year, driven by a decision by Indonesia to halt exports of raw nickel ores and news of the Goro closure. Indonesia's ban left nickel buyers in China and Japan scrambling to secure supplies amid a fear of shortages. "Vale's got lots of issues in the country," said Tom Price, a mining analyst at UBS in Sydney. 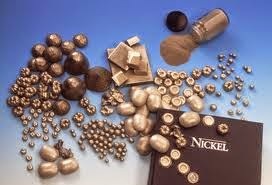 "Nickel has recovered back to the marginal cost of production. It's inviting for them to continue to invest, but it's been a world of pain for them for quite a few years." Given market expectations of Goro production of just 15,000-20,000 tonnes this year, any impact on nickel prices from the closure would be sentiment driven, Price added. LME nickel prices rose 0.7 percent to $19,745 a tonne on Tuesday. The Goro mine produced 4,100 tonnes of nickel in the first quarter, up 41 percent on a year ago. Vale is the world's second-biggest nickel producer, but Goro made up just 6 percent of its nickel output in the first quarter. The mine employs high pressure technology and acids to leach nickel from abundant tropical laterite ores. "There is an inherent risk in Goro's type of operation," said Gavin Mudd, a professor of environmental engineering at Monash University in Melbourne. As of Friday 23rd May 2014, 3 month forward LME Aluminum is seen trading at $1818/MT up by 2.70% from its previous close. We had suggested a bullish outlook on the metal in the last week and believe the same scenario may maintain in the next week too. A) Global Aluminum stocks which were at record high at 5.492 million tons in the beginning of 2014 has been continuously declining and in May as of now the total stocks stood at 5.233million tons a fall over 5% supporting the prices to rebound from record low since 2013. B) Producers are cutting smelting operations after prices declined amid rising costs. Aluminum on the LME fell 13 percent last year and in February touched the lowest since 2009. Oslo-based Norsk Hydro ASA this month said it would permanently close its Kurri Kurri plant in Australia. Earlier this year, Alcoa said it planned to shut a facility in Point Henry, Australia and curb capacity at two smelters in Brazil where producers are reducing output to the lowest in 12 years. C) Aluminum premiums are rising in Europe and Japan to a record levels in the recent time also helping the metal to move higher. 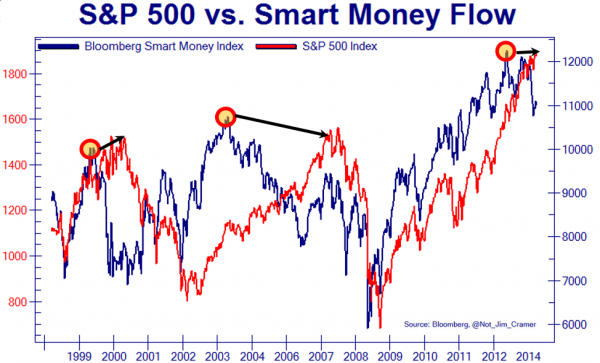 We believe similar trend may continue in the short term by which prices may remain elevated. European spot aluminium premium rose to a record $390-405/MT, from $370-380/MT a week earlier. Spot ingot premiums in main Japanese port rose to an all-time high of $380-385/MT, up from $365-370/MT previous week. D) Aluminum buyers in Japan, Asia’s largest importer, are set to agree on a record fee next quarter as demand rode out a sales-tax gain amid falling global output. E) Fees in the U.S. and Europe climbing to a record high as financing transactions and waits to get metal from some LME-tracked warehouses keeping supplies unavailable to users. 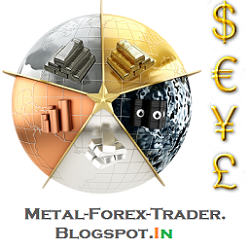 Strategy: Buy Aluminium May expiry or accumulate Aluminium mini in June at Rs. 103 and Rs. 104 respectively for a target of Rs. 107 and Rs. 109 while stop loss should be below Rs. 100 and Rs. 101.